Sam Warburton will miss Cardiff Blues' European Challenge Cup match with London Irish on Saturday because of a slight shoulder injury. 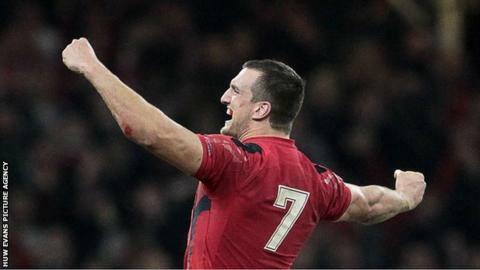 The flanker picked up the injury as he captained Wales to an historic 12-6 win over South Africa last weekend. Coach Mark Hammett says 26-year-old Warburton is fit, but will be rested as a precaution. "The next month is busy for us so to make sure Warby's 100% we're better off holding him out of this one," he said. Blues will give Gareth Anscombe until Thursday to recover from a dead leg he suffered in the win over Treviso on Friday night. Hammett confirmed that the Wales-qualified back has been registered for the European Challenge Cup, and is likely to play against London Irish if fit. New Zealander Hammett added that Warburton is keen to play despite his injury. "Unfortunately Warby picked up a couple of stingers against the [South] Africans which is likely to rule him out," added Hammett. "His mindset is just fantastic and he's up for this next month or so."